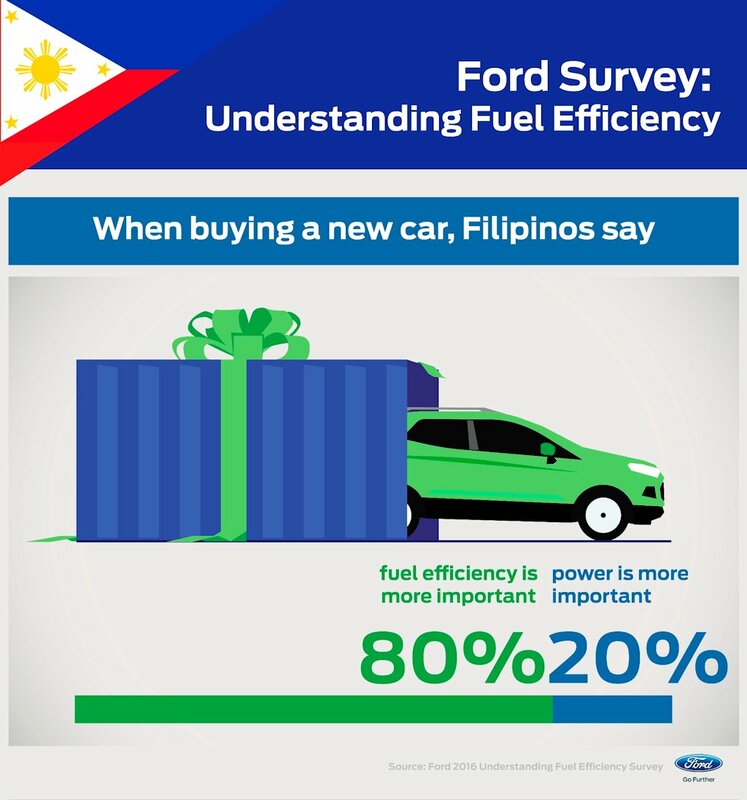 When it comes to buying a new car, more than 80 percent of Filipino consumers say that fuel efficiency is more important than power. 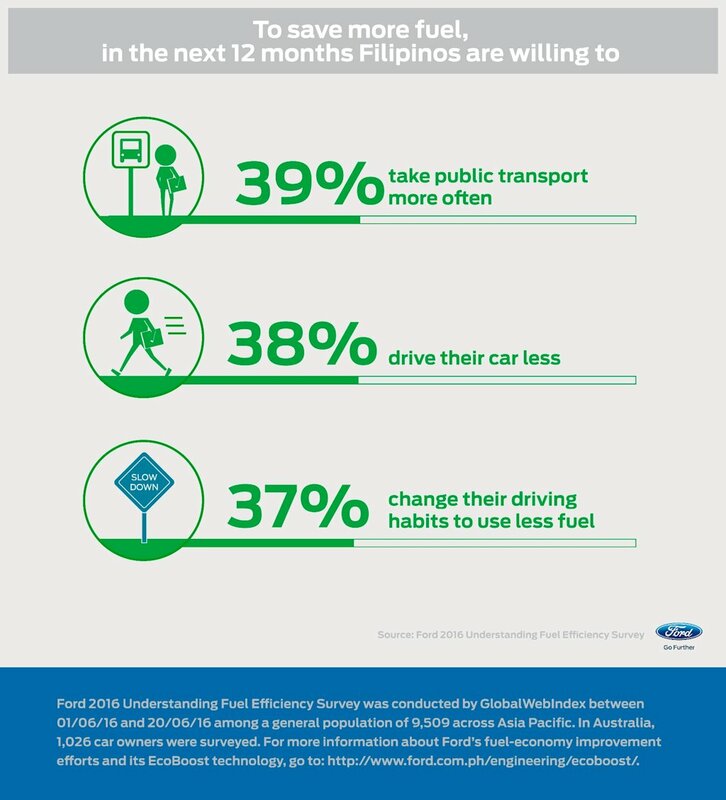 That is just one conclusion of a survey of more than 9,500 drivers in 11 market sacross the Asia Pacific region conducted on behalf of Ford Motor Company in June 2016. 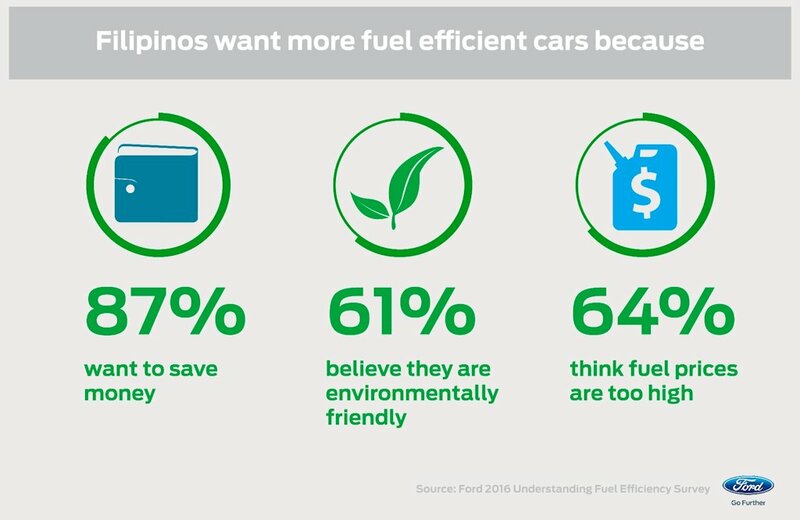 When asked the reasons for prioritizing fuel efficiency, 87 percent of respondents from the Philippines cited the need to save money. 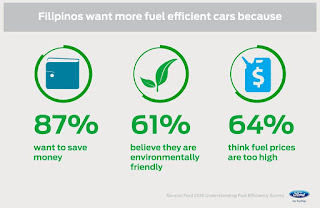 Other top reasons included concern about high fuel prices (64 percent) and an interest in being more environmentally friendly (61 percent). 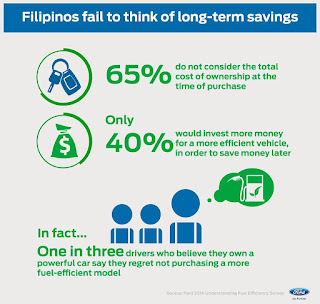 In fact, fuel efficiency is such a major factor that more than one-third (36 percent) of drivers who currently own a powerful car say that they regret not purchasing a more fuel-efficient vehicle. 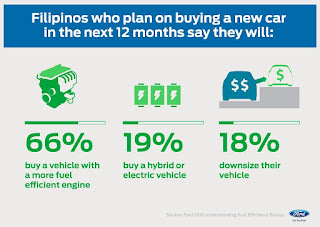 The survey revealed that the need to save money was also reflected in fuel-purchasing habits. 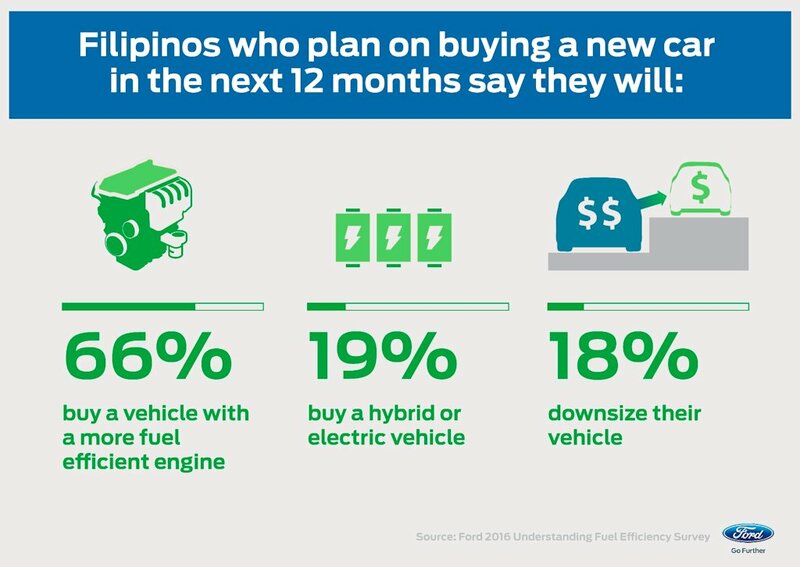 Many Filipinos said they already apply tactics to save at the pump such as waiting for lower fuel prices to top up (52 percent). 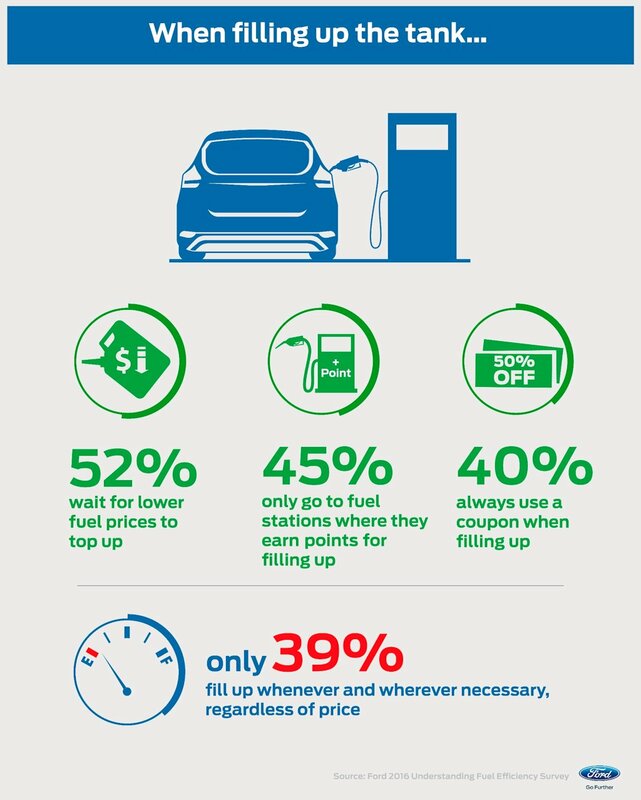 Forty five percent say that they only go to fuel stations where they get points for filling up, and 20 percent say that they use fuel comparison apps to find the cheapest rate in town. 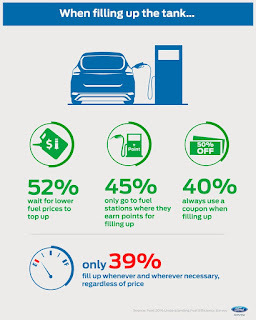 Only 39 percent say that they fill up whenever, regardless of price. Drivers are starting to change their driving behaviors too. 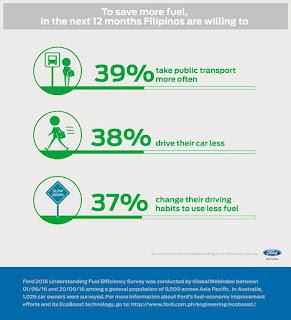 More than 39 percent of consumers are planning on taking more public transport over the next 12 months, and 37 percent say they will change their driving habits to use less fuel. 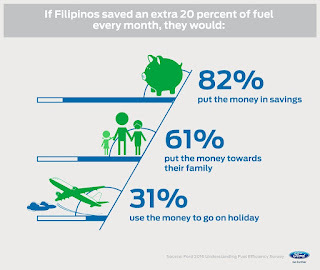 These thrifty behaviors extend to what Filipinos would do if they could save even more on fuel. 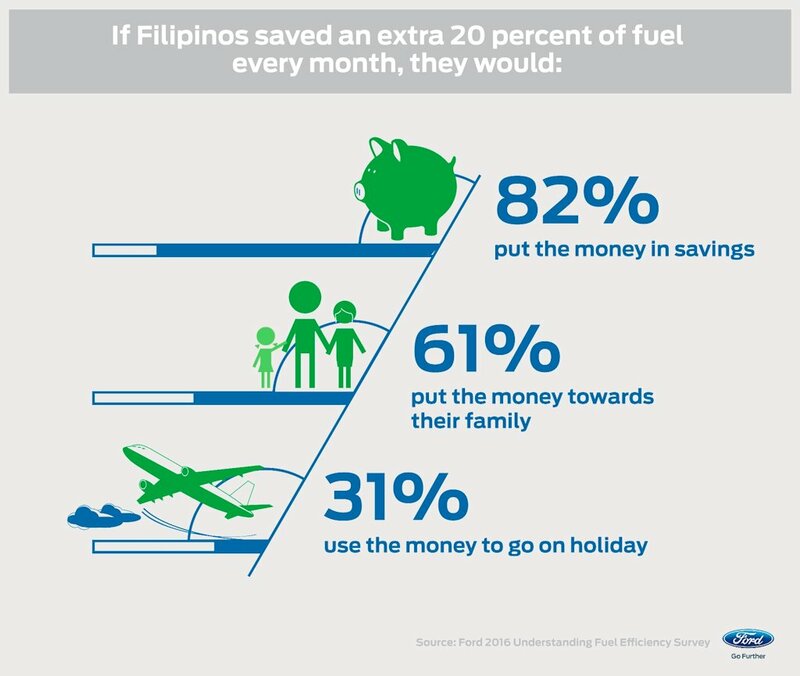 Four in five respondents said that if they saved 20 percent on fuel every month, they would put the extra money towards their savings. Another 61 percent say that they would put the money towards their family. 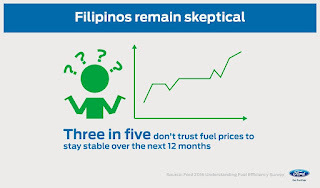 This all coincides with a general wariness about the Philippines’ fuel prices. 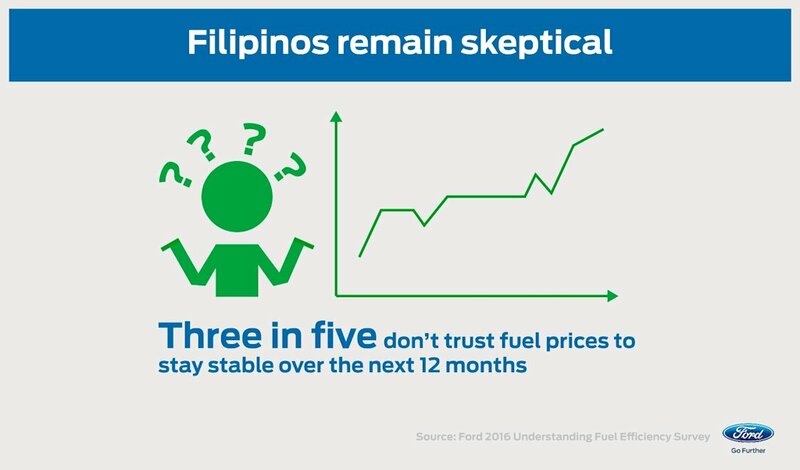 More than half (58 percent) of respondents say they don’t trust fuel prices to stay stable over the next year. Their choice is also made difficult by the fact that Filipinos also value performance. More than three quarters (78 percent) of all respondents say they consider performance as a factor when buying a new car. Suburban residents disproportionately said that they were motivated by performance (79 percent vs. 63 percent of rural residents). 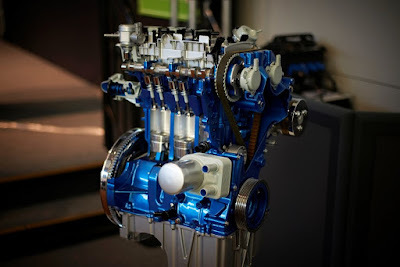 It was exactly this need to offer the combination of fuel economy and power that drove Ford to develop the EcoBoost family of engines. 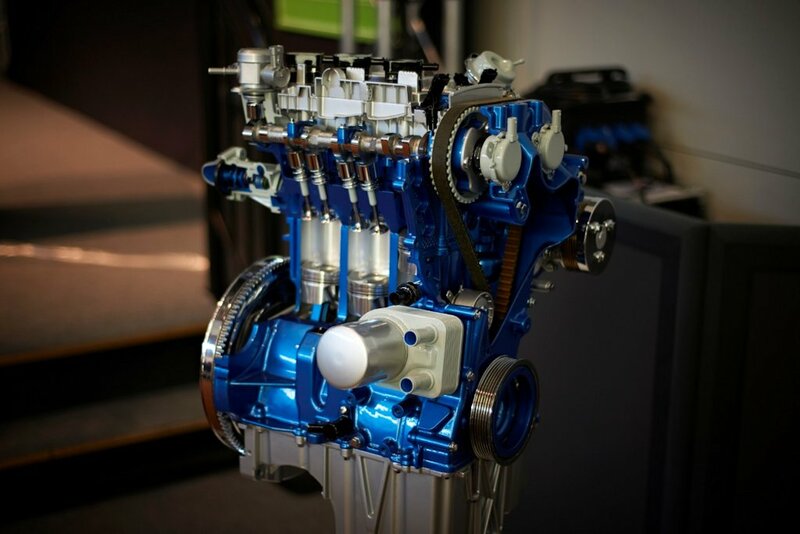 Since 2009, EcoBoost engines have been showered with awards, in fact the 1.0-liter EcoBoost engine was voted best in class at the 2016 International Engine of the Year Awards for the fifth year in a row. EcoBoost technology can now be found under the hoods of more than 20 Ford nameplates around the world – from the feisty Fiesta to the iconic Mustang. 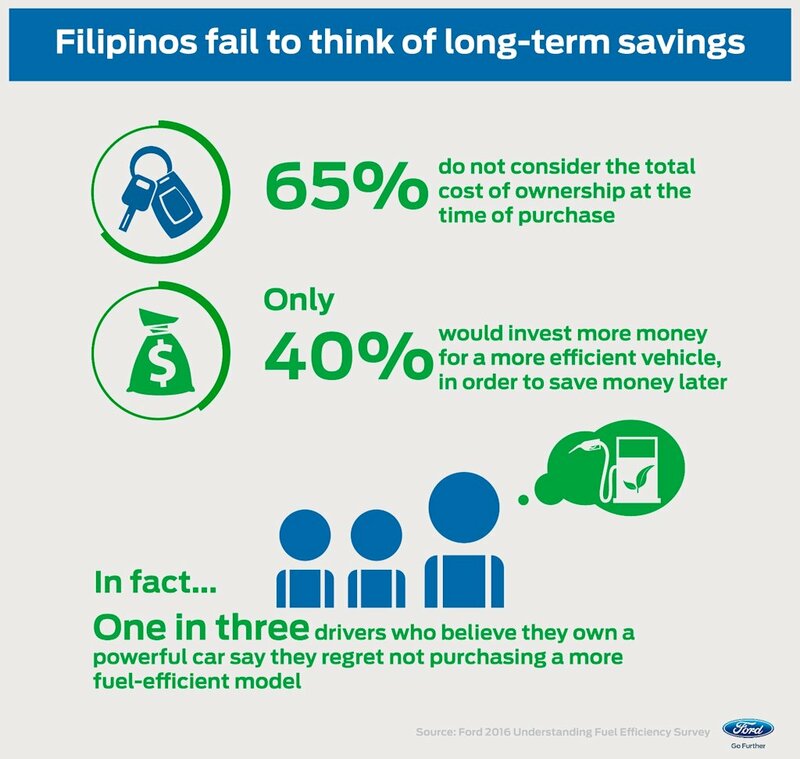 To see how the Ford EcoBoost engines stacked up against the other makes, check out the Petron Department of Energy Euro-4 Fuel Economy Run. --- and Filipinos deserve better after-sales service too Mr. Mosley! Ecoboost doesn't really save that much fuel on the road even if you hypermill your car. In fact you need premium gas to be compatible with such a technology and you have to add more than P1/ltr. compared to regular unleaded. It's under control of Gas, Oil, Logging, Mining and Fertilizer companies that just rapes this planet. POWERFUL car? That's just for bragging rights. Who needs a powerful car when you cannot go more 40 KPH on any given workday? What we need is FUEL EFFICIENY or no FUEL at all. Cars can run on Water. It's been proven since the 60's. ^ This guy speaks the truth. What about periodic maintenance? That too is a factor... Perhaps even equal to the cars' fuel efficiency. And FORD? Be ready to shell out upwards of 10k for the basic change oil change filter etc... just to keep ur warranty... And good luck claiming if ever you need to.